Hellraiser Review: Pervy demons, a puzzle box, and Pinhead – AiPT! 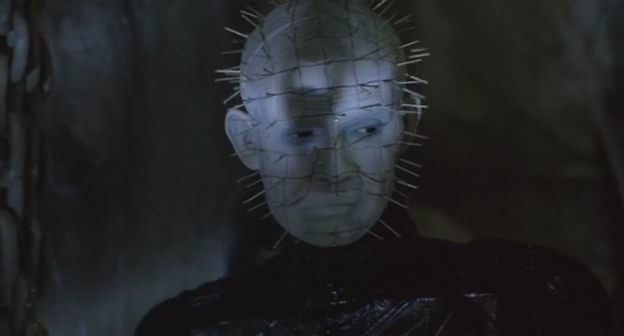 Hellraiser has an originality and uniqueness to it. I can’t believe I went so many years without seeing this! Recently, I went on Netflix and picked Hellraiser for my horror movie night. I had heard people talk about it before but had never actually seen it. As it started, I wasn’t quite sure how to feel about it, but as things got going, I started to be really intrigued by it. There were several reasons, but the main one was the originality and uniqueness it had to it. I’d never really seen anything like it before. I mean…a box that summons sadomasochistic demons from hell? That was for sure something new to me. So yes, we have pervy demons that can be summoned through this puzzle box, but what else is involved here? Well, we have this man Frank, who is playing with fire by trying to figure out this box, and when he finally does, all hell breaks loose – literally. After these demons come and basically rip him apart from head to toe, his brother and his brother’s wife move in to the house where this happened. Frank is resurrected when his brother accidentally bleeds on the floor, but he has no skin and the only way for him to fully return to his old self is by devouring other people. He convinces Julia (his brother’s wife and his former lover) to lure men to the house so he can have them and use them to get back to his old self. But those demons could find out he’s back and return for him. There are several things I really love about this classic horror film. As mentioned in the intro, I love the creativity. There are very unconventional things; the plot in and of itself is different from anything I’ve seen in this genre. I love the score, especially when the demons are summoned and you see the lights coming through the cracks as they appear. It all has a very old school feel to it, such as Frank sitting in a square of lit candles as he summons the demons, or the practical looking special effects. I like the look of this movie better than the majority CGI special effects in a lot of the modern horror films. There’s something to be said for that. Another thing I liked was the cast. Claire Higgins is great as Julia, and Sean Chapman is very believable as the despicable Frank. Ashley Laurence is good too, I mean to be completely honest, almost anyone could’ve played her character so I can’t say she was as good as Higgins or Chapman. The only negative thing I have to say about Hellraiser is that it does take a bit to get going. This is an overall fun Halloween classic for the adult viewers. If you like this type of thing, then I’m sure you’ll be into it. I’d personally suggest stopping after this first film. I watched the sequel, Hellbound: Hellraiser 2 and I’m not a fan at all, I think this original film has a sense of fun and originality that’s lost on the sequels. Hellraiser is one of those Halloween classics that's just fun - if this is your type of fun, that is.